Usually I'm able to keep working away at a project until the bitter end (aka the weaving in of ends and blocking) with no problem. But in the last few weeks I've found myself having an absolute fit of startitis, with very little to show in the way of finished projects. First came our vacation, and the need for a small portable project to take, so I'd have something to work on in the few brief moments in the car when I wasn't in fear of my life, what with all those crazy Brits driving on the wrong side of the road and all. 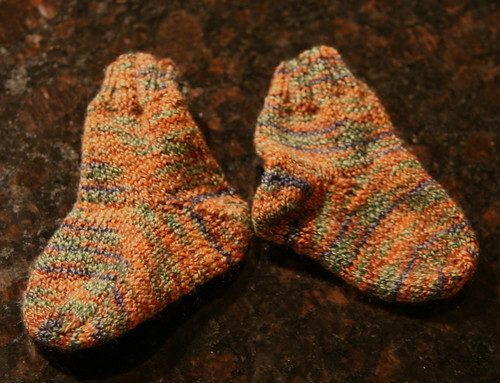 So I knit a pair of socks for Boo, which ended up actually being more appropriate for a newborn. And I started a pair of socks for Devil, whose current status is one sock done (ends not woven in) and the second sock to the heel. Good bus knitting, but not terribly inspiring. Then came the Basalt Tank from Knitting Nature. This is a fun project, but I've now made it through the two side half hexagons, and I'm having trouble getting excited about casting on for another whole hexagon. OK, it's a 5/6 hexagon, but still - it's an awful lot of stitches to cast on/pick up at once. So I pawed through the stash and started this. This is 1) really fun, since I'm basically knitting a doily with worsted weight yarn and 2) a Christmas present for some lucky family member. In fact, this is the only picture I'll post of it, since I've only got the edging left to do, and any blocking shots would just ruin the surprise. I'm not sure who's going to get it yet, but a number of the candidates do actually stop by here once in a while. Then there's the homespun Zeebee I started a while back, also perfect bus knitting, which has been languishing completely untouched in the bottom of my bag for more then a month. The problem is that I don't think I have enough yarn. Somehow it's easier to not move forward then it is to get half way through the last quarter of the hat, realize I don't have enough yarn, and rip it back yet again. Or find someone with a smaller head to give it to. Both of these last projects are immediate reactions to my sudden awareness that the holidays are just around the corner, and I may have built up some unreasonable expectations in my family as to the availability of handknit goodies at Christmas. For example, last year the three grandmothers in the family received this, and this, and this (a month late). What to do for an encore? Chunky acrylic hats for everyone, whee! With all that complaining, I do actually have an FO to show you (note: the actual knitting on this has been done for two or three months waiting for the buttons to get sewn on). Needles: US4 I think - whatever the pattern called for. Started/Finished: Doesn't bear thinking about (sometime in June I think)/Last week, let's say 9/14. Comments: A really cute and easy knit. It went very fast, and the lace panel on the front kept it from being too boring. The only modification I made was to work short rows on the neck edge instead of binding off stitches. This necessitated reworking the numbers for the top ribbing, since the pattern has you pick up fewer stitches then were left after the short rows. No big deal. It's now off to be presented to the wee one it was made for, and hopefully it will fit him for a bit. Sigh. So now I just have to keep plugging away on the projects on the needles, and try not to hyperventilate when I contemplate the ever-growing list of holiday knitting. Like sweaters for the girls. And socks for Dad. And something for Ironman? Uh oh. I'm in trouble. Or for that matter, how did it get to be the middle of July? Time flies when you're having fun, I guess (or something like that). I was all prepared to have a big photo shoot in my office today so I could show you some knitting, but I managed to not bring my camera with me. You'll have to be content with written description until I've remembered where I've left my brain and actually get organized again. The Peapod cardi is done (knitting-wise) and sewn together, with ends woven in even. Now it just needs some buttons, and it will be good to go. Thankfully, it's intended recipient is still in utero, but now that his sweater is (mostly) done, he will probably make his appearance immediately(because we all know babies don't arrive until their knitting is done). Coachella is proceeding - I've been working on it during my commute for the last little while. It's nice to knit something with 4.5 stitches/inch and size 8 needles when you've been doing socks for a long time. It just goes so quickly! Anyway, I'm finished with the top portion to the point at which I need to put the thing on waste yarn and try it on to see if I like how it drapes. Which is kind of hard to do on the bus. Although it might entertain my fellow commuters, who I suspect already think I'm a bit odd (since very often I sit there knitting away, reading a book, with ear buds firmly in place listening to the radio). The new wheel is loads of fun, but seems to be slightly warped, as Iron Man noticed on Friday evening. I'm in the process of getting in touch with the vendors to see if this will be a major issue down the road, since it certainly isn't affecting the wheel's ability to produce yarn. The only thing affecting yarn production right now is operator incompetance (and two year olds who have decided that bedtime is really only a suggestion). I have already discovered however, that a 2-ply is definitely the wrong choice for some dyeing combinations, and will result in a very nice skein of cat barf - much better to go with my first inclination and chain ply the stupid stuff instead. There's always next time. OK, a quick update on the stuff in progress. 1) The all important Peapod - thanks to an almost 2 hour bus ride home on Monday night (we sat in the HOV lane without moving for one. whole. hour.) and a day sick at home on Tuesday, I have finished the body and moved on to the sleeves. It's a pretty quick knit - aren't baby sweaters great for that? - and it's intended recipient is still ensconced in his Mama's tummy, so I'm hopeful it will get done before he arrives. Or only very shortly after his arrival. 2) The bus socks, which have been neglected horribly while I've been on a Peapod binge, are past the heel on the first sock and well into the ankle. These may have to go on hold until I can measure Dad's huge honkin' feet next weekend on his fly-by visit. 3) Last week I started a little bag to put my fancy new portable hard drive in - finished today on the ride home, but it really only took me about four hours total. There was a lot of ripping out at the beginning. When I get a free moment over the weekend, I'll write up the pattern for anyone who might be interested. Other things that have not seen any progress include Coachella (Peapod priority) and the spinning of Hello Yarn's fiber club shipment for May. Hopefully those things will be up and running soon. I have two friends who are having babies in the next couple of months, both boys. Found out a couple days ago that one of them may be arriving very very soon (and if so, quite a bit early - Mom is at 31 weeks tomorrow. Stay put baby!). So I need to get cracking on the baby knitting. Arrival #1 is getting a Peapod cardigan (if I really like the pattern, Arrival #2 might get the same thing). I'm hoping to swatch for it tonight with some Silky Wool in a discontinued olive color. I really like this yarn, especially after I throw it in the washing machine...plus I've got a whole bagful, and don't want a sweater that color for myself. Thankfully, babies in Houston don't need 100% wool sweaters. If that yarn doesn't work so well, it'll be back to the drawing board, since I can't buy anything due to the Great Yarn Diet of 2007 (hereafter to be referred to as GYD-07). But I'm keeping my fingers crossed that this little boy stays put a while longer, not only so I can get a good start on his present. Unfortunately, all other projects may get put on hold for a while so I can crank this baby out. We'll see how long it takes.